Random jottings from the day by someone who felt privileged to be there, along with Georgette Heyer’s family – nephew Major General Jeremy Rougier, daughter-in-law and dedicatee of FALSE COLOURS Susanna, Lady Rougier and grandsons Nicholas Rougier and Noel Flint – friends, countless devoted authors and an extremely enthusiastic home team from Wimbledon. To start with authorial trivia – we used this illustration from La Belle Assemblee as the back cover of the programme. It was kindly provided by Regency author Louise Allen, from her personal collection of prints. (I feel Miss Heyer would have approved.) 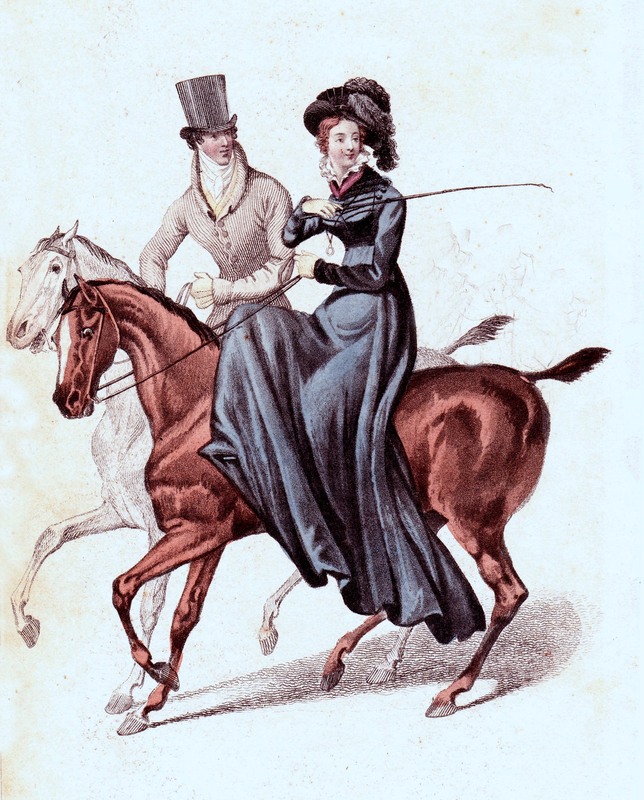 We both suspect that it may have been the inspiration for Sophy’s dashing riding habit which she is wearing when she encounters Miss Wraxton and Charles in the Park and Miss Wraxton pointedly only compliments her horse. 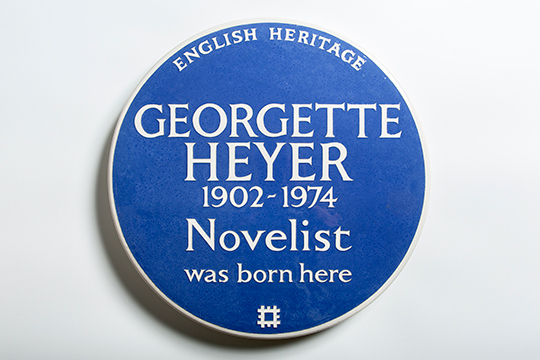 I promised that I would put up my take on events on the great day when Georgette Heyer and her birthplace received an English Heritage Blue Plaque. There is a great account of the history and purpose of Blue Plaques on their website . The very first person to be awarded one was Byron. I hope that would have pleasedMiss Heyer – and possibly made her laugh. There is a truly excellent account of the unveiling — with the bonus of a little trip behind the scenes – by novelist Elizabeth Hawksley. To interpolate another behind the scenes revelation here, the organisers did audition prosecco for the fizz role, on the grounds that is was light, summery and economical. But we rejected it in favour of champagne. Prosecco never achieved a mention in Heyer’s books and she deserved everything as handsome as we could make it. 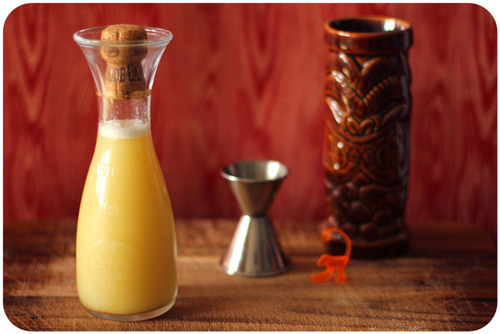 Though, as one gentleman reader pointed out, she mentioned champagne at least as often in connection with boot polishng as she did with quaffing. Maybe we should have had ratafia or orgeat .Yes, OK, I was OIC organisation and am still too close to it! It was a terrific party – one of the nicest I’ve ever been to. People who had never met before were already chatting as they walked in through the door. 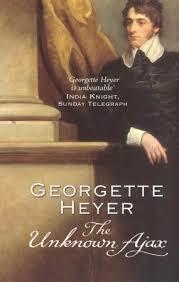 There was huge satisfaction at the recognition of Georgette Heyer’s much loved work. For once, you felt, justice had been done. 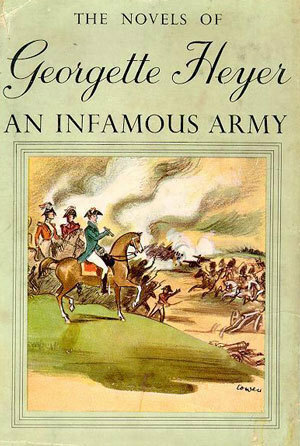 I heard favourite quotations on all sides – ‘I meant a well-bred horse’ ‘Hyde Park soldiers’ ‘a little bit on the go’ — and people who had never met before collapsed into shared laughter over a treasured Heyer moment. Above all it was warm, and friendly and fun. We were to have favourite readings over tea and it had fallen to me to choose them. As one of the world’s natural democrats, I had asked readers to tell me their favourite book, character and incident. Democracy is a terrible trap. People who wanted the same book, didn’t want the same incident or character. Cat herders of the world unite! In the end we had pieces from THE UNKNOWN AJAX, VENETIA and AN INFAMOUS ARMY. They were all splendidly read by actor Ric Jerrom and each book was the favourite of at least two people present. The company was spellbound. (‘Rapt,’ said my Dearest Friend and Severest Critic, in between buttling for Britain. He had just read AJAX, as his first ever Heyer, and had a lot to take in.) The announcement of VENETIA was received with a gusty sigh of pleasure. And yes, that was the scene Ric read, complete with dog. In my Democratic Consultation on the readings, the winner by a fair margin was AJAX – people even wanted to hear the same scene – the splendidly theatrical final Pageant of Ajax, with Richmond drunk, Claud rising astonishingly to the occasion, and Lady Aurelia, a mere female with every one of her eleven earl ancestors at her back, dismissing the Officer of the Law in one crisp speech. I’ve always admired that scene but, read aloud, it was funny, exciting, humane and touching on so many levels. ‘Great writing,’ said Ric Jerrom, who hadn’t read her before. His is the masterly voice of Jack Aubrey and Stephen Maturin in the audio versions of Patrick O’Brian’s masterwork. 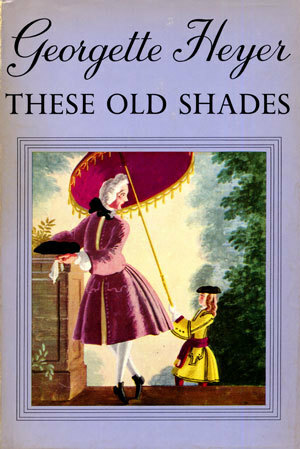 The big romantic title missing, of course, was the perennial favourite, THESE OLD SHADES. And – was it Fate? – the two people who had voted it their favourite, didn’t manage to make the tea. That coincidence gave me a frisson, I admit. Georgette Heyer married in St Mary’s Church in 1925, just six weeks after her father — mentor and greatest friend, who utterly supported and believed in her writing and whose work she critiqued and vice versa – had died suddenly after a game of tennis. It was a terrible loss. 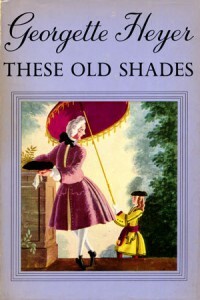 But he had already commented on THESE OLD SHADES , perhaps her most joyful book and unashamedly high romance, So the book was ready for publication, with his notes on her ms.
And following the reading of Colonel Audley’s encounter with Captain Kincaid of the 95th from AN INFAMOUS ARMY, Georgette Heyer’s nephew, Major General Jeremy Rougier, told us a brilliant story. Allowing for the professor’s excessive sensibility — the storyteller’s dramatic licence was much appreciated — the readers of Georgette Heyer present were gratified but not really surprised. For this was really a day in which people who knew her worth came together and celebrated that the word was getting out there. I had asked a number of them to give me their personal experience of reading her books. So I want to end this post with the very first reader to send me his contribution. It is a good representative of what we were all saying in our different ways. ‘As a young medical student, I came across ‘The Corinthian’. I think my brother discovered it first. I loved it; I thought it was hilarious and laughed no end. That set me off on reading Georgette Heyer books. I particular like the Regency stories with a nice plot, e.g. ‘The Reluctant Widow, ‘The Talisman Ring’, ‘The Unknown Ajax’, ‘The Toll Gate’ etc. Then I discovered some more historical novels, starting with ‘Royal Escape’ and ‘An Infamous Army’. Finally I came across ‘Envious Casca’ which set me off to reading all her detective stories. He emphasises something it is easy to forget. 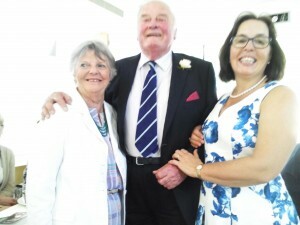 When I started to help with this celebration, I said to people who muttered about the time I was taking away from my writing to spend on it that a) it was a unique occasion and b) it was a small thank you to Georgette Heyer for a lifetime of interest and pleasure. I said it lightly – well, irritably sometimes — but it was true. A lifetime. And every reader I approached to write something, to help, to come along said the same thing. So many lifetimes made happier by her books. What a legacy. What a writer. Nicely done! Thank you for sharing. I don’t think I have ever had such an intense experience of wanting to read EVERYTHING by a writer as I have had with GH. I’d love to see that end scene in UA performed on stage . . . . But only when I have finished my current work-in-progress, she added hastily, in case any of her friends are reading this . . . Thank you for noting all that went on. She was a great writer and I would not part with my books for anything, she is eminently re readable again and again and again. Favourites are Sylvester, The Masqueraders, Devils Cub and Regency Buck. I think Sylvester has to be my favourite, too, Morag. And I love Sir Anthony in The Masqueraders, though I know that some people find that plot too contrived. Love the scene in the club when Rensley is looking for a fight and Prudence is forced into issuing a challenge. I really follow the development of her feelings all the way, up to that heady sensation of what-the-hell-I’m-jumping. “I take leave to tell you, since you will have it, that your manners belong in a tap room.” Fabulous! It was a fabulous day and a wonderful celebration. Ric Jerome was amazing. I thought his reading from The Unknown Ajax was masterly in its delivery and humour. He captured the wickedness of Damerel too. All round, I have many treasured memories to take away. It was wonderful to meet so many people who love GH’s work. So great to hear from someone who was there, Jaycee. So glad you enjoyed the readings. It was a good day, wasn’t it? And of course that was down to the readers, like you. 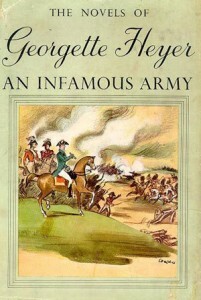 One of the private messages I’ve received said, ‘the group of fans generated an atmosphere of generous admiration and merriment that I’m sure would have pleased and astonished Miss Heyer.’ Absolutely spot-on, I thought, when I read it. Hmm. Lovely word, ‘merriment. Must use it more. Thank you for a wonderful account of the event. 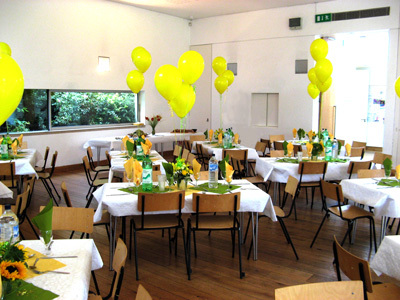 You’ve shared all the pleasure and joy of the occasion and apart from the sound of the voices as the extracts were read, I can hear the chuckles and the shared quotations. ‘A lifetime of pleasure and enjoyment’ sums up Georgette Heyer’s stories so well. It’s such a treat to reread any one of them. Thank you Beth. It was certainly a great party, as only a gathering of enthusiasts can be. Oh, this sounds fabulous – I love that line about the “well bred horse.” Poor Eugenia – stuck with Bromford in the end! I so wish I could have been there, but your description, like Heyer’s novels, give one the feeling of having been there! Thank you, Joanne. That’s a compliment I shall treasure. As for Eugenia – I think she and Bromford deserve each other. Have no sympathy with either of them. I do sometimes wonder, though, whether Bromford was an early sketch of the insufferable Edward Yardley in VENETIA. He is much worse. Indeed, if I were ever to write fan fiction to Heyer’s oeuvre, it would be a story which made sure that nice, conscientious, jilted but well-behaved Clara Denny escaped from the appalling Yardley, for whom GH and Venetia seem to have destined her. Thank you for this wonderful post, Jenny. It really captures the sheer fun of the day. And thank you, too, for your kind mention of my blog. Wouldn’t it be great if GH’s current publishers brought out a new paperback edition using the original covers. I just love the Arthur Barbosa covers in particular; they capture the feel of the period so well. I so agree with you about the Barbosa covers. Could have slipped right out of Ackermann’s monthly.